Visit us at BERING to enjoy an exclusive joint collaboration offer! 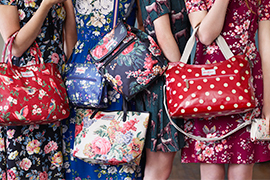 Spend $250 and receive a complimentary Cath Kidston voucher for your next purchase. Happy Shopping! From now till 31 Dec 2015, enjoy up to 40% off selected watches! Promotion is valid till 31st December 2015 and is not valid at COCOMI @ Raffles City. Exclusively at Cath Kidston Suntec City store, receive a free compact mirror with a minimum spend of $110 nett. This month, COCOMI brings you the wheel of fortune! Come on down to SPIN the wheel with any purchase and stand a chance to WIN attractive prizes!